Brave Robotics’$2 1/12 scale Transform Robot Version 7.2. This week, robots can’t stay true to form, learn to lie, and slappa da bass. 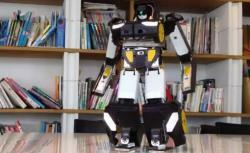 Back in June we got a look at an earlier version of this shape-shifter, developed by Brave Robotics in Japan. This compact device is remote-controlled and goes from four wheels to two legs at the touch of a button. It’s a lot speedier this time around—the transformation from car mode to humanoid once took about 14 seconds but is now complete in five. In humanoid mode, the bot can shoot plastic darts from its hands and do a little victory dance. In both states, it can use a Wi-Fi enabled camera to transmit images to an iPad in real time. It’s an impressive engineering feat, and it comes at no small cost: The bot is listed on the Brave Robotics website for 1,980,000 Japanese yen, or about $24,000 USD. That might be a little steep, but for something this cool, it’s still worth asking Santa to pull a few strings. This transformer was inspired by a very different type of shape-shifter. Developed at MIT, this robot is known as the Milli-Motein—a name that pays tribute to its small size and to proteins, the biological molecules it mimics. The bot seen here is essentially a chain of four units. Each unit has a small motor to turn the joint it’s connected to, and by turning each unit in various ways, the bot can take on many forms. Proteins work in much the same way, linking together and folding to create new structures. The project was funded by DARPA, which demanded that each unit be smaller than one cubic centimeter. There aren’t really any commercial prospects for this device quite yet, but according to Bloomberg Businessweek, some of the technology involved could be used to improve flap controls in airplanes or thrusters in satellites. For this shady bot, Georgia Teach researchers took cues from one of nature’s most adorable con artists: the squirrel. Squirrels are scatter hoarders, meaning they gather food and store it in distributed bundles in an area. They then watch over that area, moving from one stash to another to make sure the snacks haven’t been pilfered. But their trickery kicks in when they know a competitor is nearby—they’ll act as though they’re checking on food, when really they’re stopping in random spots. These robots work in much the same way. The first bot rolls around, monitoring its caches of virtual food. When a second robot comes along, the first begins bluffing. According to the research, it took the competitor robot an average of 10.4 minutes to pilfer food when the first robot was tricking it, compared with 7.69 minutes without deception. This technology could be useful in the military, where robots could be used to guard supplies on a battlefield. Just don’t let your lazy Roomba learn this tactic, or you could be in for some dirty floors. Bassist just quit your band? Humans are so unreliable. Why not let the MechBass take over? Designed by engineering student James McVay at Victoria University of Wellington, New Zealand, this contraption is good enough to fill in for Muse bassist Christopher Wolstenholme in “Hysteria.” McVay built the robobass for an honors project using 3-D CAD software, laser cutters, and 3-D printers to build MechBass. Even without a fret board, each string plays the right note. The result is a machine fit to join the best of robotic musical acts, and it won’t even demand its share of the earnings. - A seafaring robot traveled from San Francisco to Queensland, Australia, powered only by solar energy and the motion of the ocean. The journey of more than 10,000 miles took about a year, and the device from Silicon Valley’s Liquid Robotics gathered information on the oceanic and atmospheric conditions along the way. Oh, and an autonomous vehicle traveling 10,000 miles on its own? Yeah, that’s a world record. Learn more from Slate’s Trending News Channel. - As the prophetic English philosopher Elton John once said, it’s lonely out in space. To help with that, researchers at Tokyo University have set out to build a communications robot, intended to accompany Japanese rocketman Koichi Wakata on a six-month stint aboard the International Space Station next summer. Read more from io9.